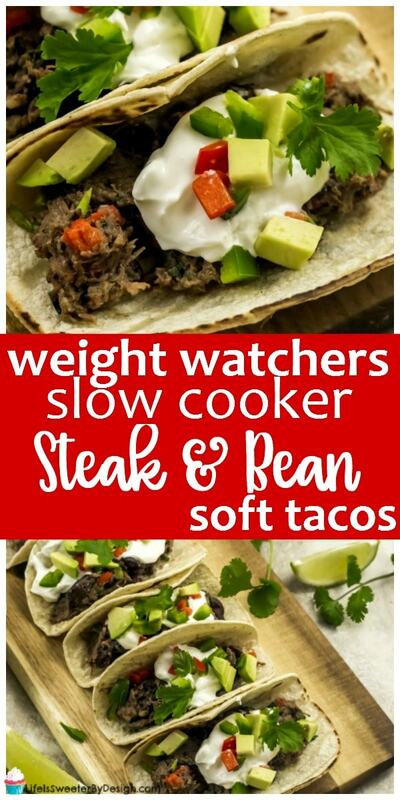 Weight Watchers Slow Cooker Steak and Bean Soft Tacos are so tasty that no one will realize they are a “healthy” recipe! I love Weight Watchers recipes like that!! 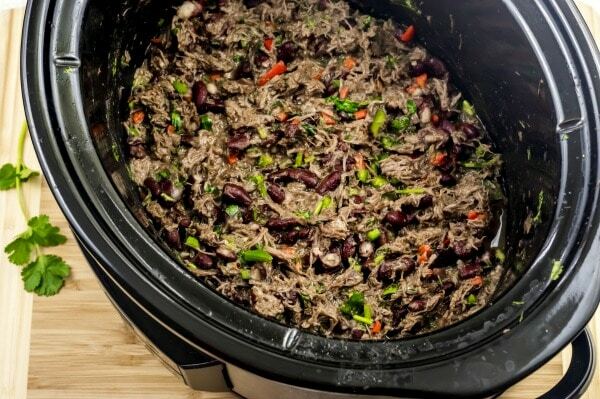 I also LOVE that these are made in the slow cooker because it does all the work for me. Steak is higher in points then chicken, but sometimes steak is just what you want. Luckily most of the ingredients are zero points so that helps keep this from getting too high in points. 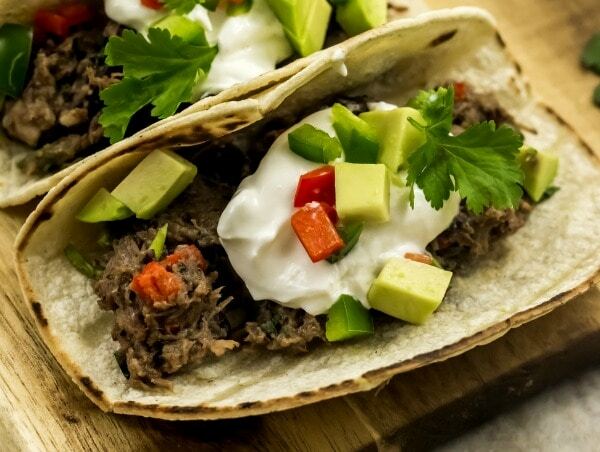 Using corn tortillas is the best way to keep a lid on the points. If you prefer flour tortilla be sure to adjust the points for those. This recipe is 5 Freestyle SmartPoints per serving. You get TWO soft tacos per serving! That is a nice filling meal! Whisk together broth and chili powder in 5 or 6 quart slow cooker . Cover and cook until steak is fork tender—4 or 5 hours on high or 8-10 hours on low. Transfer steak to cutting board . Discard all but ¼ cup of cooking liquid. Wipe out slow cooker. With 2 forks, finely shred beef. Return beef to slow cooker, stir in reserved cooking liquid, ¾ cup of the salsa, the beans, cilantro and jalapenos. Cover and cook on high until heated through—about 10 minutes. 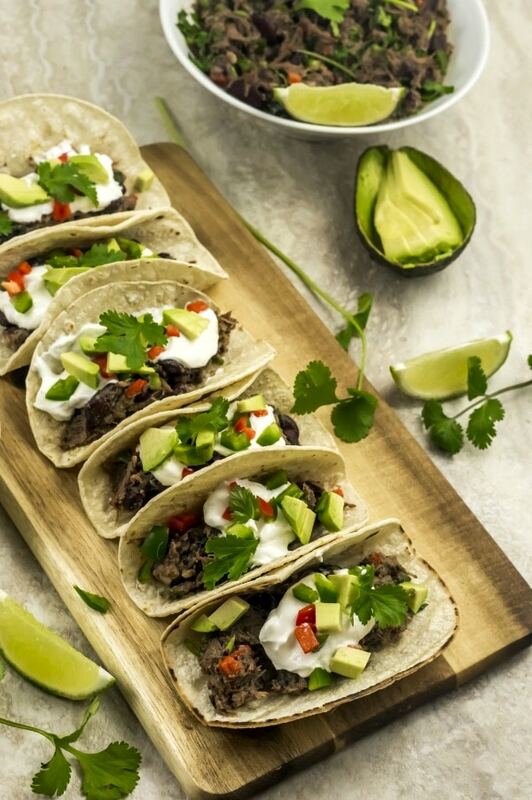 Divide beef mixture evenly between the 12 corn tortillas. Top with remaining salsa and sour cream if desired. What is on Your Meal Plan? What is on your meal plan this week? If you need some easy ideas be sure to check out this family friendly freestyle meal plan. It is easy to get bored when you eat the same things over and over again. I love new meal plan ideas! What are your go-to meals? 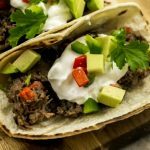 Weight Watchers Slow Cooker Steak and Bean Soft Tacos are a family friendly meal that cooks while you are at work! Whisk together broth and chili powder in 5 or 6 quart slow cooker. Cover and cook on high until heated through---about 10 minutes. Serving size is 2 soft tacos. Each serving is 5 Freestyle SmartPoints. Be sure to add points if you use cheese, sour cream, avocado, etc. I calculated this using Mission extra thin corn tortillas. If you use a different brand the points may be different!